Family Favorite! Steps to Beach, Lake, Nature Trail, Pools, Discounted Bikes! Our property is only 275 yards (3 to 4 minutes walk) from a private beach access and was recently updated including king and queen pillow top beds, new stainless appliances, new flat screen TVs, various new furniture and decor, additional sleeper sofas, paint and carpet. The property looks like new! Inspired by Nature is located in Cassine Gardens in Seagrove Beach, FL. 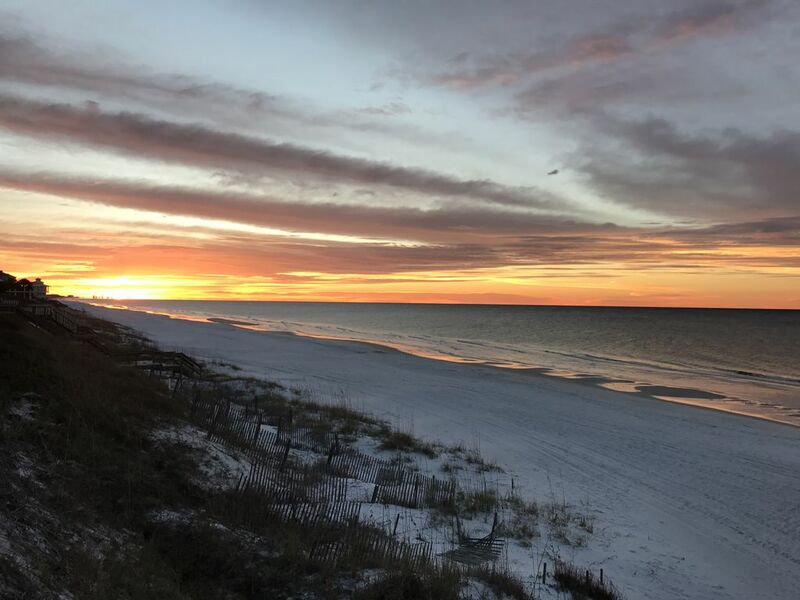 Seagrove Beach is approximately one mile from Seaside and only a few miles from Grayton, Rosemary and Seacrest Beaches. Cassine is a great location, especially for families. It's situated in a cypress grove along a state forest so it's very peaceful. In addition to the beautiful beach, the property offers miles of nature, fitness and biking trails, two pools, two tennis courts, a private lake with a gazebo and grills for cookouts and a basketball hoop. The lake is stocked so kids can fish in the lake as well. Our townhome is a spacious (1,200 sqft) two-story end unit with 2BR and 2.5 BA that sleeps up to eight. The property was remodeled in 2018 and is conveniently located only 275 yards (3 to 4 minutes walk) from a private beach access. It is also located next to one of the entrances to our nature trails and less than 100 yards from one of two pools, the lake and the tennis courts. The townhome offers a fully furnished kitchen and a secluded deck off the living room. The master has a king bed, private bath and private balcony. The second bedroom has a queen size bed, a bunk bed and a private balcony. The bunk is a double futon bunk that sleeps 2 on the bottom and one on top. There is also a new, queen size sleeper sofa in the living room. Both bedrooms have fans. There are flat screen TVs and DVD players in each of the bedrooms and the living room. There is also a stereo and video / reading library in the living room. We also provide complimentary beach equipment, discounted bike rentals through local bike shops and an initial supply of paper and soap products with this property. We own two properties in Cassine. They are approximately 150 yards from one another. The other is Poolside Serentiy (VRBO #802171). Please let us know if you are interested in renting both properties for large parties. We take pride in our guests’ experiences and hope you chose to stay with us at one of our properties. Thank you for visiting our website. My wife Anne and our son, Quinton, purchased Inspired by Nature in 1997. My wife and I live in South Bend, IN. Our son lives in Charlotte, NC. We have come to love Seagrove Beach and Cassine Gardens so much that we purchased a second townhome in Cassine in 2016. If you are part of a large group, and need two properties, please check out our other townhome VRBO 802171. We fell in love with Seagrove Beach, especially Cassine Gardens. Seagrove was laid back and intent on not becoming commercialized like Destin or Panama City. The beaches were also incredible. The sand is powdery white and the water is an incredible emerald color almost year round. That's probably why the Gulf Coast is regularly included in the Beaches of the Year awards. As for Cassine, it offered a unique beach / serene nature setting. The homes and townhomes are spread throughout a cypress grove so the area is quiet and peaceful. We knew after visiting Seagrove that we had found our second home! Cassine offers a serene nature and beach setting. It also offers two pools, two tennis courts, nature and fitness trails and a small lake with a gazebo and grills. As for our unit, we also offer free beach equipment. The unit is only 250 yards from a private beach access. The property is approximately 250 yards or a short 3 to 4 minute walk from the beach access. The property is in the Cassine Gardens Cassine Village area. We are less than 100 yards from the lake. Our property is less than 100 yards from the onsite lake. It is close enough to see from the deck or side of the property depending on foilage etc. Television in each bedroom and living room. Balcony of each bedroom and off living room. Two free adult bikes and beach equipment provided. No pets or smoking please. Primary renter must be at least 25 years of age. See contract and policies for further details.